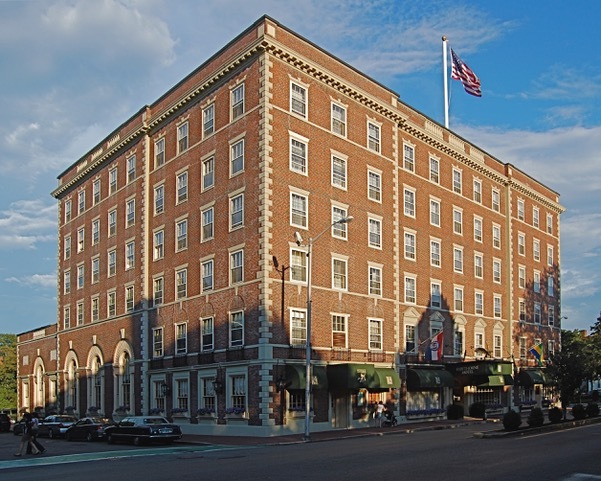 The elegant Hawthorne Hotel, built in 1925, is the beating heart of historic Salem, Massachusetts. The hotel has a rich history hosting innumerable business and leisure travelers as well as dignitaries and celebrities. 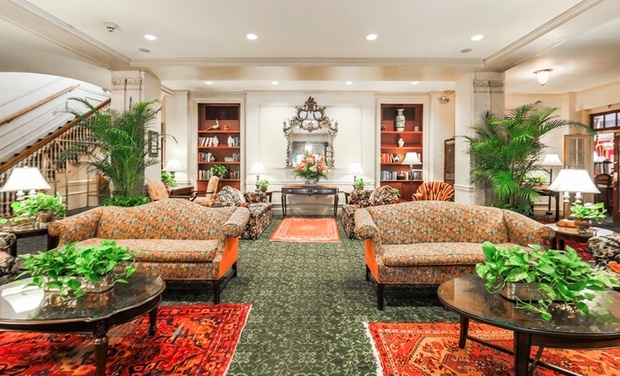 Over the years, the Hawthorne Hotel has hosted well-known personalities including newsman Walter Cronkite, actress Bette Davis, General Colin Powell, and President George Bush and First Lady Barbara Bush. Episodes of iconic shows including Bewitched, What Not to Wear and Ghost Hunters have all been filmed on this historic property. In 1984, Vanessa Redgrave called the hotel home for a month while making Three Sovereigns for Sarah. Take Exit 45 left toward Route 128 North toward Gloucester. Take Exit 26, Lowell Street East/Peabody Square, Salem. Follow Lowell Street one mile to the center of Peabody. Peabody Square is denoted by a tall monument in the Square; go straight through the Square for one additional mile staying in the left lane through several traffic lights while passing from Salem into Peabody. At the end of a mile you will take a left at the lights onto Route 107 North/ Bridge Street. Follow Bridge Street 3/4 of a mile to the traffic lights on the overpass and stay in the right lane. Stay straight through the lights, staying on Bridge Street and take the first right onto St. Peter Street. At the end of St. Peter Street, take a left on Brown Street. At the end of Brown Street, you will be facing the Salem Common. Take a right and the hotel is on your left. Pass the hotel and make a left at the lights and the parking lot will be directly behind the hotel. Take Exit 45, left toward 128 North toward Gloucester. If you are renting a car, be sure to ask the attendant to direct you towards the Airport Exit. As you are exiting the airport, follow the signs for Route 1A North towards Revere/ Lynn. Carefully follow signs for Route 1A North. Go through several small towns and within a few miles of the airport you will come to two small rotaries. Stay in the right lane for Route 1A North at each rotary. Look for North Shore Community College. Just before the college, Route 1A takes a left turn and then an immediate right turn. Watch for the signs at intersections. Once you pass the Entering Salem sign, you will quickly come upon Salem State College South Campus on your left. At the Sub Shop, bear right – staying on Route 1A. Pass the Central Campus Parking and Salem State’s main campus on your right. At the light in front of the college, turn left continuing on Route 1A/ Lafayette Street/ Route 114 West. Follow Lafayette Street until you arrive at the Fire Station across the street and turn right onto New Derby Street/Route 1A North. At the next four-way stop intersection, turn left staying on Route 1A North/Hawthorne Blvd. Hawthorne Hotel is one block up on the right. You can pull up in front of the hotel to unload your baggage. Parking is the right turn at the light before the hotel, or the corner right after the hotel. See MBTA schedules for times. From North Station in Boston, go towards Rockport/Newburyport. Approximately 29 minutes from North Station in Boston to the Hawthorne Hotel. Most conference attendees have found taxis or Uber are the easiest ways to get from the Airport to the Hawthorne Hotel. On the way back to the airport, many conference attendees share cabs. If you prefer to take public transportation, here is the link for more information. Taxi from Logan Airport to North Station, then Commuter Rail to the Salem MBTA Station (Newburyport/Rockport Line, it takes about 30 minutes). Here is a link to the commuter rail map. Here is a link to the bus schedule. The Hawthorne Hotel is a half mile from the Salem MBTA Station, about a 10 minute walk. Things To Do In Salem, Mass.